Nutrition and Cooking is obviously something that's very important to me (hence this blog). I try a lot of different things and I try to cook and bake things that are reasonably healthy. Some of my friends have certain food restrictions like Celiac Disease and so I informed myself about that too. I had posted some recipes on this blog and it got noticed.
. It took me a bit longer to go through the book than what I had expected, but that's due to the fact that she gives so much wonderful information. What is great about the book is that Joy's suggestions are easy to follow, the book is written in language everyone can easily understand and it's not riddled with scientific expressions we have to look up in a dictionary. I had a few little ailments particularly uneven skin tone, breakouts, weak nails and hair breaking off. SO I started with the chapter about healthy skin and hair. And then I began incorporating items from Joy's food list into my diet, not that I didn't eat them before, but just not enough of them. Because I was just plain lazy. Joy's Grocery List makes it very easy to choose the items you need and you'll see there are so many suggestions that you are bound to find a few things you like. In every category there is so much to choose from. Don't like tuna or sardines, the you can choose wild salmon and crab, or herring or tilapia. Hate carrots and cellery? Eat Avocado, mushrooms and collard greens, there is something for everyone. So I stocked my fridge with baby carrots, persian cucumbers (I like them because they are small and I can just easily take them with me and cut them up at work), edamame came in easy prepackaged portions and greek yogurt is my new favorite snack. For our dinner options we increased out fish servings to about twice a week, evenly split between salmon and tilapia. There are so many different way you can spice your tilapia, because the fish itself is very mild and it will take on whatever seasoning you like. You can steam it, bake it, grill it and fry it in a pan with little to almost no oil and it tastes great. The book contains many many recipes for breakfast, lunch and dinner and a ton of snack suggestions as well. Thus I eat more variations of nuts now, Brazil Nuts are my new favorite. I've tried some of them and they are so easy to follow, even a Non-Cook can prepare them with ease. 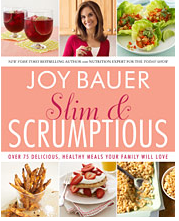 Also try Joy's other book "Slim and Scrumptious" for more recipes. One of our favorites is Joy's Beef Stir-Fry. It is so easy to make and you can very easily make many different variations of it, like adding in mushrooms, substituting edamame for the sugar snap peas, or cauliflower for the broccoli. My snacks now contain a lot of veggies, I make fresh juice from carrots, apples, tomatoes etc and I drink a lot of water and unsweetened caffeine free herbal tea. The results are great, my skin tone has evened out, the dark patches are gone and I hardly ever have a breakout. My nails don't peel and split anymore and they grow and are healthy. And you want to know the best thing about it, it wasn't half as hard as you think it is! And as a positive side effect my joint problems are diminishing too due to the fact that a lot of foods help with many common ailments that affect us. I highly recommend this book to anyone that wants to feel better, live better and combat common issues with better nutrition. You can help yourself by eating healthy and delicious at the same time. A health diet doesn't have to be plain and boring. Joy Bauer's Food Cures will show you that you can eat healthy and delicious at the same time. 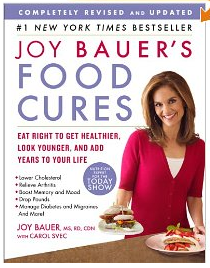 Check out Joy's Website at www.joybauer.com for many more suggestions, great articles, a free diet profile and so much more. You can also follow Joy on twitter @joy-bauer or follow her on facebook.